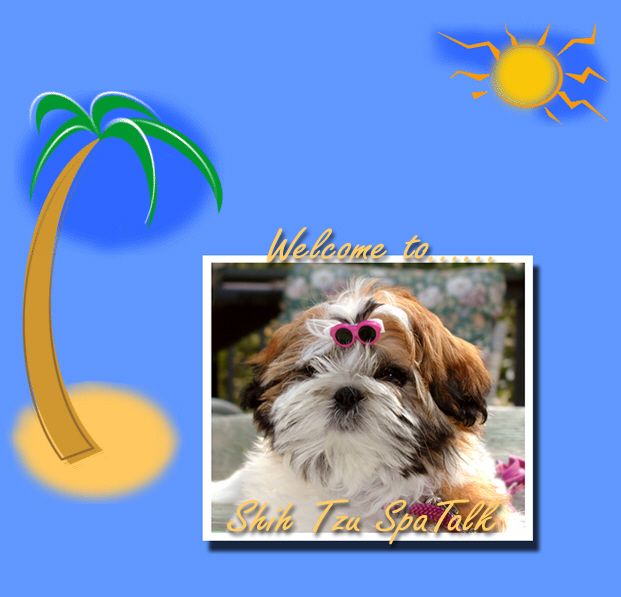 Welcome to Shih Tzu SpaTalk! Hi! I am a Shih Tzu. We are a precious breed, originally from Tibet & China. We were given to Chinese Nobility as "gifts". Shih Tzu SpaTalk! is my messageboard, where Shih Tzu Show Breeders/Handlers, Dog Groomers, and Pet Owners alike, can meet to discuss various Shih Tzu topics. Grooming, Nutrition, Health, Show Ring Competion, Product Reviews and more are available topics on my board. This is also a great place for new shih tzu owners to learn more about how to care for us. We have many links to informative Shih Tzu articles, books and Clubs. My board is a FUN, relaxing, informative gathering place. If you are not a current owner of shih tzus, but are thinking about getting one, please make sure to do your research! Please do not buy a shih tzu puppy (or any puppy) from a pet store, puppy mill, or a backyard breeder. Go to AKC, or equivalent type, Dog Shows. Meet with the Show Shih Tzu owners/breeders after the show. They will have show puppies and "pet" puppies available at times throughout the year. Responsible Show Shih Tzu owners and breeders care about us! They make sure they are improving on our breed type. You can also go to the SPCA. Many Shih Tzus end up there because of irresponsible owners, backyard breeders, and puppy mills! You can help save us! Shih Tzus are a wonderful breed, but we are "high maintenance". We require a lot of grooming, love, time, and care. We love children, but we are not suited to very small ones, as Shih Tzus are delicate. But, we think we are big!